Florovsky is arguably the most important Orthodox voice of the 20th century. He argued and demonstrated time and again what he referred to as a “neo-patristic synthesis,” a clarion call for Orthodox theology to return to its roots in the Fathers and within the Orthodox Tradition. Many would today be surprised that Orthodox theology was ever otherwise – but in Florovsky’s youth, theological academies in Russia were heavily influenced by the West (from both Protestant and Catholic directions – classes in some cases were conducted in Latin), as well as those in Greece and elsewhere. There are few Orthodox theologians writing today, who have not drunk deep from the wells that Florovsky argued for. Vladimir Lossky was a protege; Met. John Zizioulas considered himself a student of Florovsky; Fr. Alexander Schmemann was a colleague both in France and in America. The landscape of Orthodox theology at the beginning of the 21st century would likely look much different had Florovsky not lived and wrote and taught. His own view of the role of Orthodox theology, written in the mid-twentieth century, would likely have to be revised at this point in the early 21st century, even though the task he set for Orthodox theology has never been completed (and rarely attempted). The landscape of the Church has changed. The Orthodox Church that Florovsky addressed consisted almost entirely of those who had been born to the faith. Though revolution and other circumstances had created a “diaspora,” placing many Orthodox in the West – the Church was still an Eastern Church with converts being rare and frequently turned away. Today, Orthodoxy in America is quickly becoming “native.” Both converts whose roots have always been in the West, as well as the descendants of original diaspora Orthodox becoming “Westernized,” the Orthodox Church in many places in the West today can speak of itself as “Eastern” only as an historical artifact. Its converts have not become “Eastern” in the process of becoming Orthodox – we have not become citizens of a foreign culture. Deeply influenced and immersed in Eastern experience – yes. But I would contend that converts have become to a great extent individual examples of Florovsky’s original proposal. They are now Orthodox Christians who have personally experienced the “western religious tragedy.” As a result of that tragedy they have come to Orthodoxy, but never as a tabula rasa. Every convert who enters the Church brings with them, in some fashion, the inheritance of centuries – problems not of their own creation but inherent to the West and to the modern Western world. To a large extent the problems of the “West” have now become universal problems for the simple reason that Western culture has become the dominant culture of the world. Others have our problems whether they want them or not. As converts within the West or even just Orthodox living in the West the inner encounter between Orthodoxy and Western experience is unavoidable. Thus I see Florovsky as a “prophet” of sorts, but with the playing field drastically changed. He did not see the consequences of an Orthodoxy that could speak English (or French, or Spanish, or any number of other “Western” languages). Interestingly, my primary dogmatics professor, when I was an Anglican seminarian, had done his doctoral work under Florovsky at Harvard. His voice and vision echoed in that professor’s classes. How many Anglicans wrote papers on St. Gregory Palamas in earlier decades? I can recall reading Palamas (who was just beginning to be translated into English) and bringing his thought to bear on the problems raised in my theology classes. It was Florovsky’s vision – but in an entirely different setting. It is not surprising that I should have eventually become Orthodox – it is where the answers to my questions had always been. Today, in ways and in places that many would not think of as “theological” in the formal sense, Florovsky’s vision is being fulfilled. We are the West – all of us who live here and many who do not. And within our own hearts is the crucible of Western tragedy meeting the patristic synthesis of the Orthodox East. At first the encounter can feel almost schizophrenic. It is all too easy to simply be anti-Western. But this is not an answer – just a reaction. God is not anti-Western, else He would have withheld Orthodoxy from us. But He has not withheld it. He has plunged it into the very midst of our culture with the assurance that the gates of hell will not prevail against His Church. 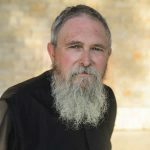 And in the hearts of His people this great encounter of patristic theology – the living inheritance of the Christian Church – meets all the various forms that the “Western religious tragedy” has taken. I believe the meeting that takes place in the heart is not to condemn the tragedy (for Christ did not come into the world to condemn the world) but that through such an encounter the tragedy might be raised from its own brokenness into the fullness of the Church. I write as an Orthodox Christian – but I cannot pretend that there is nothing “Western” in what I do. Who would I be kidding? By the same token, I daresay that no other Orthodox writer in the West, including those born within the faith, can claim to do otherwise. Florovsky’s vision is not an enterprise to be undertaken – it is a prophecy of an inevitability. It is an inevitability because God so loved the world. There are no tragedies that God does not take into Himself – no failures that he has disowned. He has become what we are that we might become what He is – and it is happening before our very eyes. 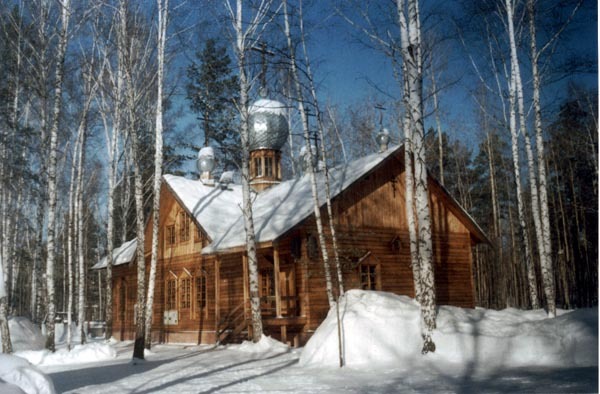 The photo is of All Saints of Russia Orthodox Church in Akademgoroduk outside Novosibirsk. It was built in the 1990’s. Had I not described it’s location it could easily be a picture of any number of newly built Churches in the West. Florovsky’s vision is, in many ways, very universal. Russia is being reimmersed into the Church after generations. It is more than a mere re-discovery and cannot be a mere re-discovery. It is inevitably something more. What was your sermon on today? Do you ever publish those? Also, I promote both the theology that comes out of the seminary in Paris and the seminary itself to my friends who are critical of Russian Orthodoxy because they see it as being backwards. I think it wouldn’t be harmful to see the history of the Church as a recapitulation of the history of Israel. Under David, the Kingdom was united, but after Solomon’s folly, the people became divided into the North and South. Then the North was conquered, and finally the South. So too, the church was one, until the folly of filioque divided East and West. Then the West succumbed to further heresy, and the East suffered physical enslavement under the Turks. But as the people of Israel were able to return from Babylon and rebuild the Solomon’s temple, may we too be granted God’s grace to reunify the church and the world under the banner of Holy Orthodoxy, untrodden by the state and undefiled by heresy. May God grant our prayer. The irony of God using and redeeming so many unlikely people and situations throughout scripture gives one an appreciation for the unbelievable irony of the Eastern Church taking root in the U.S.
Just to have conversation between the evangelical forms of Christianity that evolved largely in the US in recent decades (or lets say 2 centuries) and Eastern Orthodoxy – though not so much at a formal level is significant. I think that most of the 20th century’s history of “formal talks” have shown that they are not often the most productive model. But the “confrontation” if I can use so strong a word, that occurs between an American Church that had largely become too comfortable with a “sized down” version of Christianity and the fulness of Eastern Orthodoxy with a theology rooted in the Councils and historic liturgy, yet espousing the fundamental necessity of a living union (relationship) between God and man, is bound to yield interesting fruit. Much of that fruit, as I’ve argued above, is taking shape in the hearts of converts, but I suspect that it goes and will continue to go beyond that. Clendenin’s work is a good example. I’d like to believe that “something is happening out here, before our very eyes” but sometimes I just don’t know. I am currently in-between the cultures (for lack of a better word). I come from an Evangelical background and am heading into Orthodoxy, and I’ve seen this happen with some of my peers, but I can’t help but wonder if it’s just other people like me. In other words, I’m dying to know if it is happening or is even noticed by the classic Evangelical pastors of my youth, or some of the other folks from my history — I’m 38 years old and have moved, it feels, a distance from those times, in my wolrdview, as well as geographically. What are the signs that you’re seeing? I would not look for the signs in the leadership and in the most obvious places. In many ways those places cannot afford to do much other than what they are doing now. But you yourself are an example of things happening before our eyes. The inner engagement both with Orthodox tradition as well as the “Western religious tragedy” takes place within you and is in thousands of others. I don’t think we have to see a map, or necessarily even know where all this leads. But it was not happening when Florovsky wrote, or barely. And it is happening now. Conversion of folks in the West to Orthodoxy, is not simply a movement from one ecclesiastical group to another, but a meet of two worlds. And it is significant. My point in the post is that this encounter is taking place, but not so much on the formal level as on the level of the heart. The influx of evangelicals into the Antiochian Archdiocese changed many things for that Orthodox jurisdiction. 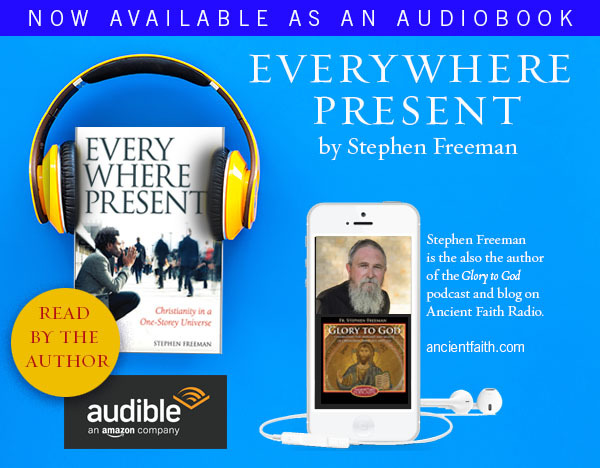 The fact that today we have things like Ancient Faith Radio, that Orthodoxy is speaking as publicly as it does and with an ear that is aware of American religious issues is quite significant – though how you would measure it would be beyond me. At this point I note only that it is happening. God alone knows its outcome or its measure. I am too often looking for circumstances to point to for my family’s sake, you know, in an effort to create a solid case or to legitimize what I’m doing, etc. Same old Evangelical tactic. I guess I’d be better off concerned with the state of my heart, since that where it happens, and really the only territory I can claim as my responsibility. Neil — Yesterday at my large evangelical church, the wife of a friend whispered to me her husband was “taking a break” from church for awhile. I looked around the room and noticed that there are very few men in their late 30’s and 40’s. I can only assume the disappearing husbands and dads are the result of the same restlessness I’ve been experiencing for years. I am also surprised by how much talk I hear of “Family Integrated Churches” and home churches in general. As Barna documents in his 2006 book “Revolution,” there’s a growing acceptance that it’s OK to leave organized church. Home churches are popping up all over my hometown. More and more churches in the PCA are practicing weekly communion, including one influential “flagship” church. This is not even noticed by many , and indeed churches are still being planted, but my guess is that longevity is declining. I have many Baptist friends who admit that they are in total disarray. One pastor I know sneaks off to charismatic conferences and is talking alot about prophecies and dreams. It’s the Baptists who are starting up most of the home churches. I joke about it, but I confess to being in a spiritual depression and I know that I am not alone. There is clearly a version of the “Western theological tragedy” that Florovsky would never have imagined. It is today complicated by market-driven theologies and the politicization of theology in America (at least obscuring many things). The “market-driven” theologies have, in my opinion, created the “thinnest” version of Christianity ever to have existed. There is a need to engage Christ in His fullness that the market would never dream of suggesting no matter how many times it is queried. The only query that I recall Christ making was: “Who do men say that I am?” and at the time only one man answered correctly. Statistically insignificant – but not insignificant to God. God is deeply at work in our culture – but on a level and in a place that may never reach anyone’s survey. God alone knows. What would our nation look like if all we could see was the condition of the human heart? Hungry. Or desperate and confused? Or ignored and left to shrivel up? I’ve experienced all three, I think. Jim — All that sounds familiar. In my own walk through the array of evangelical church expressions, I particpated in much of what you describe and more. One of my last flings before seriously pursuing Orthodoxy was a house church, part of the “Emergent Church,” that was very deconstructivist and critical in weekly discussions, though the pastor tried her best to help us all to reconnect with Jesus in a variety of creative arts ways. They now consider themselves a new urban monastic community of sorts. Several years ago when I was still part of that group, I particpated in lectures on how to use the arts for the making of an authentic Christianity in our lives, city and world. I was so hungry for what I’ve discovered was the Orthodox Way along. And I got tired of feeling like I had to apologize if things seemed to churchy. I’d still feel that way, I think, if I were trying to live an authentic Protestant evangelical life, because it all seemed so “thin” to borrow from Fr Stephen. Now the only “thin” I have to worry about is my own distracted heart. Even just a taste of the Ancient Church path — which can be very current, timeless, in fact, with no apologies necessary — has given me enough to start with, as far as authentically making sense of my faith, who I am, who God is, etc. I thank God for this and am constantly in need of His mercy. Jim — I looked into the link you gave and some of the other thoughts in your comments above. (Insert whistle of amazement here), it’s all mind boggling to me. I’m pretty simple as far as theological discussions go (back in my Baptist days, I never did figure out the finer points of the pre-trib/post-trib debate, and it all seemed so ridiculous to me). In my fantasy world, I would step into discussions like these and hand the particpates a copy of the Nicene Creed and a few choice works by the Early Fathers and expect it all to clear up. But that’s why they call it fantasy. Neil — when I talk about these kind of conflicts, the typical response is that, as long we agree on the essentials, it’s OK. They are not “salvation matters,” but of course they absolutely are. There is simply no way those in the aforementioned blog debate can claim to be in communion with each other. That’s the kind of response I’ve gotten recently from my mom and my sister, to a degree. I love that they are concerned (my mom) and interested (sister), but it’s difficult to give them insight into what I’m learning about the Orthodox Church w/o sounding arrogant, even on the rare occasion I know what I’m talking about. Or maybe especially when I know what I’m talking about. I look (from time to time) for language that can say what I want to without sounding arrogant. It’s why I prefer “fullness” to “One True Church,” or even the language I’ve used about 2 storey universe stuff. I listen and think, because I believe what I want to say is worth saying and worth hearing – and if possible worth pushing past the arguments. God gives grace and sometimes the right words come. My parents were chrismated at age 79. I have found that “fullness” incites less of a struggle in a conversation. I always wonder, though, whether it is received with agreement because of some understanding or as a relativistic concession. I guess it’s not for me to know what goes on in the hearts of others. As I’ve stated before, I’ve got my plate more than full with my own heart. Lord have mercy. In some instances, though I have found that explorations of many different spiritual paths will draw not so much as a skeptical nod from my family and others, while Orthodoxy —or at least, presented by my words — draws concern and chatter behind my back. My father-in-law is apparently concerned by the books I’ve been reading. (Titles like “The Orthodox Way,” and “Orthodox Spirituality”) It is frustrating to me that people (my own family!) can “turn a blind eye” to much that is done, even when it is clearly erroneous, sinful, etc, but then be startled awake by something so good, probably just because it looks different to their narrow American vision… Honestly, what do they think people of other cultures do w/o a 3 hymns and a footbal analogy in a sermon every Sunday? Obviously, this strikes a chord with me, forgive me for the rant. Neil – on giving people insight into Orthodoxy – I think what’s challenging is that I’ve found that it is true (at least for me) that you have to live it, immerse yourself in it, as it were. Now, how do you explain that to somebody that wants a 5 minute answer on “why Orthodoxy?” How do you sum up the process of going from knowing nothing of the liturgy to craving it? Or from having no engagement with the saints of our Faith to living through a year with them and starting to see, for the first time, names and stories that are now sort of familiar? Or starting to see the organic fullness of Orthodoxy that you know is there but can scarcely explain to yourself? The good news, I think, is that authentic life has a cadence that doesn’t conform to the “do it now” mentality of the modern world. To see that Orthodoxy has that cadence – even if it hinders an elevator speech on the thing to others – is deeply, deeply reassuring. At a talk I gave last year at the Colloquim for Anglicans on Orthodoxy, I said, “You’ll be surprised to know that I am a cradle born Orthodox, who lived for 43 years in schism from myself.” It drew a laugh, though I was sort of serious. If the Orthodox Church is what we say it is, truly the Body of Christ, then it is the true home of everyone who comes into the world. So I theologically considered that and made my statement. Actually, it’s the only was to say things and be consistent when we say we found that we were “coming home” when we entered Orthodoxy. This is man’s true home. But I don’t think I’d use it in an elevator conversation. Thanks Phil, I’ve been experiencing what you’re talking about to some degree. And yes, I can relate to the “coming home” that everyone is talking about. I feel I’ve been looking into or hungering after Orthodoxy for at least a decade and the limited exposure I had before that, though unrecognizable as the Orthodox Church at the time, intrigued me sufficiently to stand out in my memory now as a starting place. But as a starting place, I lik ewhat Fr Stephen is saying, that this is our true home from the start. I believe that, I think, though i hope and expect that it will be more revelaed as I enter in. Hope that all makes sense. I’m rushing to a meeting. Pray for me, a sinner.